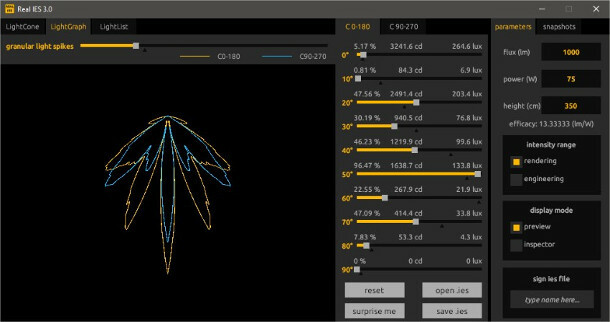 PlaySys has released Real IES 3.0, the latest version of its software for designing synthetic photometric lights for use in DCC tools and game engines. The update makes it possible to design lights with asymmetric light cones, and adds new LightGraph and LightList views for inspecting the properties of the lights being created. First released in 2015, Real IES enables users to design synthetic photometric lights for use in DCC software or game engines. The lights are generated as Type C .ies files, supported natively in 3ds Max, Unreal Engine, and renderers including Arnold, Corona and V-Ray. Users can create lights “in a few seconds” by adjusting intensity sliders corresponding to 10-degree bands of the light cone, with the results previewed in a cross-section display. New features in Real IES 3.0 include the option to design lights that are not rotationally symmetrical, creating separate cone profiles for the C0 and C90 cross-sectional planes. Numerical intensity values for both planes can be viewed in a new LightList tab, which displays them in one-degree bands. There is also a new LightGraph display, which shows a proportional photometric polar diagram of a light. The LightGraph tab includes a LightSpikes slider, intended to generate lighting profiles with sharper borders within the light cone than would be possible using the standard workflow, as shown in the image above. Other changes include UI and workflow improvements – including the option to enter parameter values manually – and the option to export lights as rasterised 32-bit EXR files. Real IES 3.0 is available for Windows 7+ only. It costs €59.99 (around $69), which is a one-off payment entitling buyers to free updates “forever”. You can see the product roadmap on Trello. The software is licensed on a per-user basis, so you can move it between machines.